This book provides the first edition with an extensive introduction and full commentary of a unique land survey written on papyrus in Greek which derives from that area of southern (Upper) Egypt known as the Apollonopolite (or Edfu) nome and is now preserved in Copenhagen. 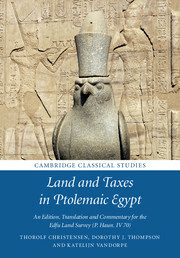 Dating from the late second century BC, this survey provides a new picture of both landholding and taxation in the area which differs significantly from that currently accepted. The introduction sets this new evidence in its contemporary context, drawing particular attention to what it reveals about the nature of the relations of the Ptolemaic royal administration with local grandees, Egyptian temples and the army. No student of Hellenistic Egypt can afford to ignore this text, which importantly extends our knowledge of Upper Egypt under the Ptolemaic kings and involves some modification to the prevailing picture of landholding in Hellenistic Egypt. Recording Village Life presents a close study of over 140 Coptic texts written between 724–756 CE by a single scribe, Aristophanes son of Johannes, of the village Djeme in western Thebes. These texts, which focus primarily on taxation and property concerns, yield a wealth of knowledge about social and economic changes happening at both the community and country-wide levels during the early years of Islamic rule in Egypt. 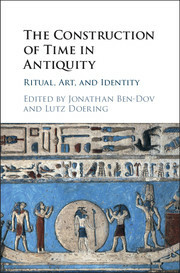 Additionally, they offer a fascinating picture of the scribe’s role within this world, illuminating both the practical aspects of his work and the social and professional connections with clients for whom he wrote legal documents. Papyrological analysis of Aristophanes’ documents, within the context of the textual record of the village, shows a new and divergent scribal practice that reflects broader trends among his contemporaries: Aristophanes was part of a larger, national system of administrative changes, enacted by the country’s Arab rulers in order to better control administrative practices and fiscal policies within the country. Yet Aristophanes’ dossier shows him not just as an administrator, revealing details about his life, his role in the community, and the elite networks within which he operated. This unique perspective provides new insights into both the micro-history of an individual’s experience of eighth-century Theban village life, and its reflection in the macro social, economic, and political trends in Egypt at this time. Edited by D.J. Mattingly et al. Saharan trade has been much debated in modern times, but the main focus of interest remains the medieval and early modern periods, for which more abundant written sources survive. The pre-Islamic origins of Trans-Saharan trade have been hotly contested over the years, mainly due to a lack of evidence. Many of the key commodities of trade are largely invisible archaeologically, being either of high value like gold and ivory, or organic like slaves and textiles or consumable commodities like salt. However, new research on the Libyan people known as the Garamantes and on their trading partners in the Sudan and Mediterranean Africa requires us to revise our views substantially. 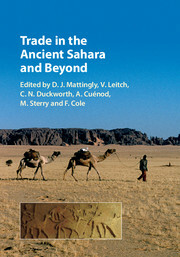 In this volume experts re-assess the evidence for a range of goods, including beads, textiles, metalwork and glass, and use it to paint a much more dynamic picture, demonstrating that the pre-Islamic Sahara was a more connected region than previously thought. 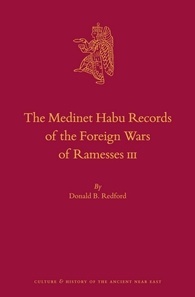 The Medinet Habu Records of the Foreign Wars of Ramesses III is a new translation and commentary of the Textual record of Ramesses III’s military activity. As such it dwells heavily upon the inscriptions dealing with Libyans and Sea Peoples. Since the format is oral formulaic, the texts are scanned and rendered as lyric. The new insights into the period covered by the inscriptions leads to a new appraisal of the identity of Egypt’s enemies, as well as events surrounding the activity of the Sea Peoples. The exercise is not intended to dismiss, but rather to complement the archaeological evidence. 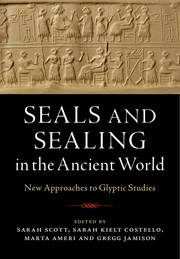 Edited by Sarah J. Scott, et al. Next Post Scribal Spotlight: A Void in the Great Pyramid? Scribal Spotlight	Scribal Spotlight: A Void in the Great Pyramid?